San Francisco was spared during the first wave of influenza in the spring of 1918. As the second wave took its toll on eastern cities in September, San Franciscans theoretically had plenty of time to prepare themselves for a possible onslaught. Dr. William Hassler, Chief of San Francisco’s Board of Health, was an early advocate of taking strong preventative measures against the flu. 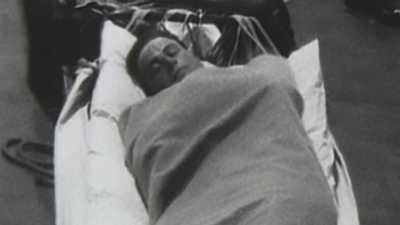 He, however, seemed to curb his concern and went so far as to predict that influenza would not even reach San Francisco. The reasons for his change of opinion are not clear, but what is known seems to indicate that public officials did their best to downplay any news that would alarm or inconvenience large numbers of people. Little notice was made, therefore, when Edward Wagner, a new arrival from Chicago, fell ill with the deadly flu of 1918 on September 24. 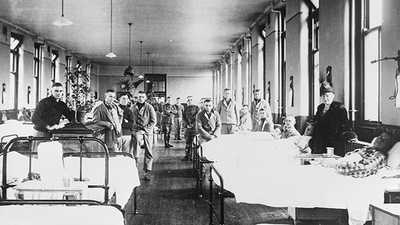 As the city was divided into districts, each with its own medical personnel, telephones, transportation and supplies, an already-depleted corps of medical professionals was forced to admit they were not up to the challenge before them. A Dr. W. Fowler of San Jose reported seeing 525 patients in a single day. So overburdened was the Red Cross that they could respond to only half the calls they received. Appeals went out to citizens of every stripe to assist in providing care to the sick; students, teachers, retirees, and homemakers rolled up their sleeves and did what they could do to aid the ill and comfort the grieving. Typically, immigrant communities were the hardest hit by the epidemic. Whether due to language barriers, entrenched poverty, or overt racism, immigrants routinely failed to seek out and receive proper medical care. Many lived, even in the best of times, in conditions bordering on squalor. When influenza struck, such environments only fostered its rapid spread. One matter of grave concern was the collection of garbage. The number of city workers able to collect and dispose of refuse fell as illness thinned their ranks. As a stop-gap measure, huge mountains of trash were simply covered over with dirt. As the medical community frantically attempted to cure the flu or hold back its advance, numerous totally useless and possibly dangerous vaccines were foisted upon a desperate public. One of the more highly touted efforts involved the wearing of gauze masks to thwart the spread of flu germs. A law was passed making it mandatory to wear the masks in all public places. The city’s mayor, with the backing of the Board of Health and the Red Cross, boldly declared, “Wear a Mask and Save Your Life! 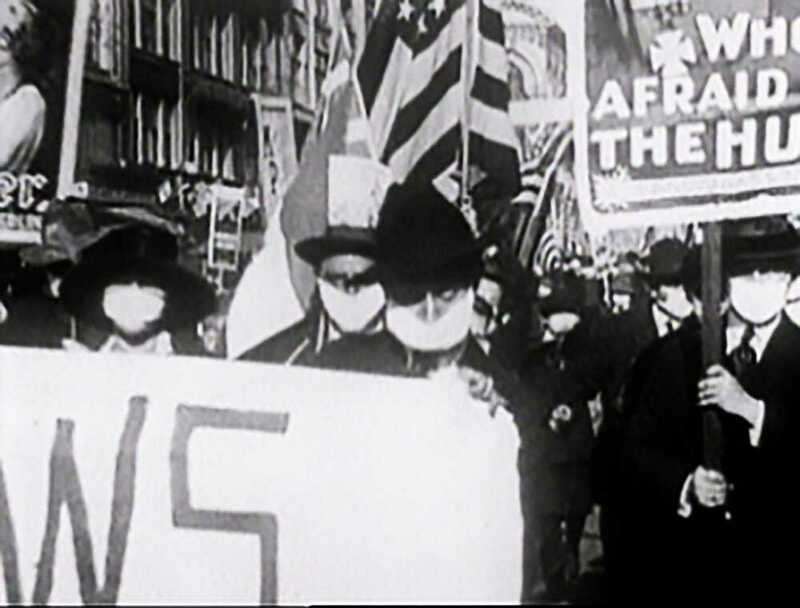 A Mask is 99% Proof Against Influenza.” Citizens of San Francisco were reminded to don their masks through a popular rhyme of the day: “Obey the laws, and wear the gauze. Protect your jaws from septic paws.” Generally, the public obeyed and those who did not went to jail. 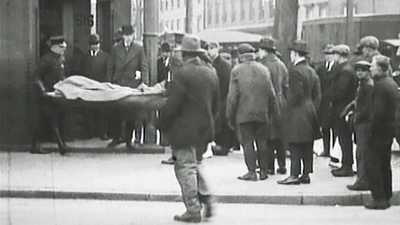 Siren wails on November 21, 1918 signaled to San Franciscans that it was safe, and legal, to remove their masks. All signs indicated that the flu had abated. Schools re-opened, and theaters sought to make back the $400,000 they had lost during each of the six weeks they were closed. The city had survived its attack of influenza in better shape than many of its eastern counterparts: 23,639 cases reported and 2,122 deaths. But any thoughts of victory over the flu were premature. Barely two weeks after the celebratory removal of masks, new flu cases were reported. Five thousand new flu cases would surface in December 1918 alone. Fortunately, round three of influenza was far less severe than either rounds one or two. Still, scores were brought low by flu and many eventually succumbed to it, bringing the final tally of influenza fatalities to over 3,500.